I posted a BYGL Alert on July 20 regarding Cicada Killer Wasps (Sphecius speciosus) cruising lawns and landscapes in southwest Ohio. However, since that time, I've been slammed with reports and questions concerning these "giant wasps." So, I'm reissuing my cicada killer report; it appears there are some very heavy localized populations. These large wasps are the nemesis of Dog-Day Cicadas (Tibicen spp. ), so it is no coincidence that they appear on the scene when dog-day cicadas emerge. Cicada killers are the largest wasps found in Ohio, measuring 1 1/8 to 1 5/8" in length. As with all hymenoptera (wasps, bees, etc. ), only the females possess stingers (ovipositors); however, they are not aggressive. The males are aggressive, but they lack stingers. The females spend their time digging and provisioning burrows with paralyzed cicada-prey. The males spend their time establishing and defending territories that encompass females. They will aggressively buzz any transgressor who dares to enter their territory; including people. The females prefer to dig their brood burrows in bare, well-drained soil that is exposed to full sunlight. Although the wasps are considered solitary, all of the females have the same nesting requirements. So it is not unusual for there to be numerous burrows, and wasps, in relatively small areas. The males are notoriously defensive and will chase after other males as well as picnickers, golfers, volleyball enthusiasts, and gardeners. Fortunately, it's all a rouse since they lack the necessary equipment to deliver a sting. 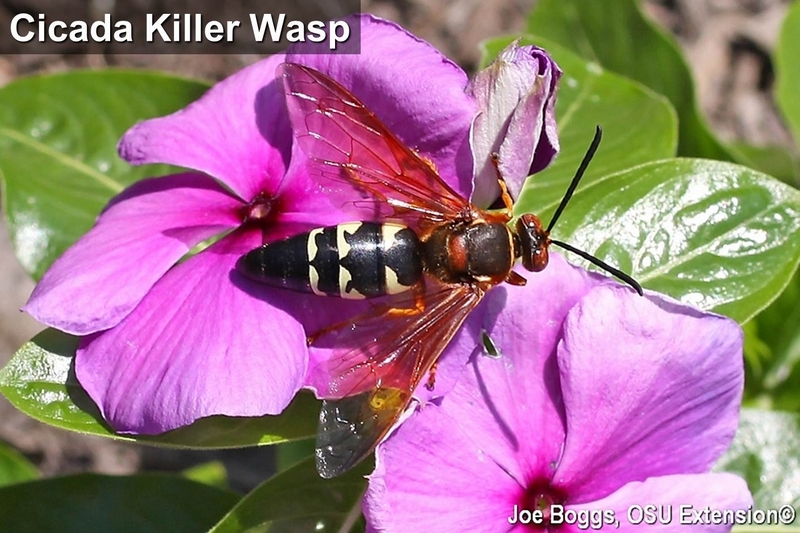 Cicada killer wasps feed exclusively on dog-day cicadas, so they are considered beneficial insects. However, their low-level flights over sand volleyball courts, sparse lawns, and bare areas in landscapes can be disconcerting generating demands for control options. Cultural practices that promote a thick growth of turfgrass will usually eliminate a cicada killer infestation in a lawn in one or two seasons. In landscapes, the wasps prefer loose soil in full sun; however, they will occasionally set-up shop in open areas that are covered in a thin layer of mulch. Deeping the mulch layer and periodical raking to disturb the mulch or adding plants to shade the soil will make conditions less favorable for the wasps. Since this is a beneficial insect, using insecticides to kill these wasps is discouraged. Education is one of the best approaches to reducing the angst sometimes caused by these wasps.